For years, I dreamed of having an open kitchen with white cabinets. Envisioning it filled with family and friends was the goal. I knew that laminate cabinets were our option because the alternative was not in our budget, nor was it even important to me. Well, for nearly thirteen years, I have been more than content with those cabinets, but lately I have been getting the itch to change things up while working on a minimal budget. My answer? Begin the process by painting my laminate cabinet island. The difference that $10 can make is amazing. For five days this past week, I was without a camera. (That is blogging suicide, especially when I decided to do a ton of “before/after” things.) So as soon as I take more pictures, I will do a detailed “how to” of painting laminate cabinets. Not wanting you to miss out on my project, my ten year old graciously videoed my thoughts on my “new” kitchen, and other touches I am working on. This is just my first baby step and I can’t wait to bring you along for my changes…little bit by little bit. My infamous video editor (teen son) was at the beach, so…it’s a bit long, but hopefully, it will get some of your creative juices going along the way. I love the color in your kitchen! Great job, you are so creative. Thank you for sharing with us. For being real on your blog. I come by and visit almost daily. But this is the first time I commented. Have fun painting, I look forward to seeing what you finally decide on. I think the blue is a little too bright when I see the green in the living room, but it may look different in person than it does in the video. It works with the yellow, though! 🙂 I love seeing what you do, and am anxious for your post on painting laminate, because it’s something I need to do. Do you think a salmon color would work? I kind of like the blue knobs. They look good with the blue island…it’s kind of beachy :)! I like the blue knobs – they tie in with the island! And I’m in love with that blue! I am also looking forward to your post on how to paint laminate. I have two ugly, old laminate dresses that I’ve been wanting to paint, but not knowing how. Oh! And I also got a really cool shelf thingy that I want to use in the playroom or my sewing room (ha! I call it that …) but it’s made of some real wood, some paneling and the counter-level part is laminate (I think), but it will look GREAT with new paint! Ok, here’s an idea about the knobs, spray paint all the upper ones silver like you said, but make the lower ones blue to match the island. It’ll be a bit whimsical, fresh and unexpected – like the island! oh Abbie – I may have to play with this…thanks for the great idea. What a cute video of you! And for the record, I like the color as it is. And I actually like those blue knobs, too! 😉 Great job! not that it doesn’t look great but i have another question for you:) by the way, i spray painted an ol’ brass hanging light at my old house and it looked great. people thought i bought a new one. i’m really praying about doing it so i would love to hear your story. My journey is a series of ups and downs as far as staying on task. Sometimes I do it well, other times…not so much, but through it all, I have an amazing relationship with my children and the chance to live the nitty gritty, day by days of life with them. Scrolling back to the beginning, there may be some of my story, but I don’t really remember. I do need to do a few home school posts and as our school year winds down, I’ll have some time for that. I like the blue! I like it with all the white and the yellow. (I also think the blue knobs are cute and beachy). I like the color of your island. I was thinking maybe beadboard would give it a different look too. Or they have a textured, paintable beadboard wall paper at Home Depot that you could apply and paint over it. I say add the molding, love the color. Thank you for this post my husband and I have talking about changing our kitchen but no funds. Our biggest problem is that the front of our cabinets are laminate and I really want to paint my cabinets, can’t wait to show my husband your video because now we can. The blue is gorgeous. I second Abbie’s comment above about keeping blue knobs on the bottom cabinets and silver on top. That would really tie in the blue with the rest of the kitchen. What a fun spot of color! 🙂 I really love it! I LOVE the color and it does make your kitchen “happy”. Maybe there is a way to tie it in with the great room with some paint, pillows and other accessories. I know you could find some fabric as I used those colors on my screen porch. One fabric is a boat village scene and the other is a stripe with salmon, lime green, aqua, yellow, white,pink, and brown. I think they were Waverly fabrics. The porch looks refreshing which was the theme I was going for. I, too, am a color addict and thinking of doing my kitchen in a lime and periwinkle blue scheme. It’s only paint, right?! Thanks for the spray paint idea for the knobs as I have lots of those to replace, too. I also just bought new door knobs and hardware for all the rooms upstairs…. found them on Overstock.com pretty cheap. love, love, love the blue! it’s gorgeous! i think i would die w/o my camera! hope you get it back soon! How fun! We repainted our cabinet handles with stainless steel spray paint two years ago and it made a big difference! The one handle we use A LOT (our pantry) is starting to wear at this point, so bear in mind that you might have to re-paint every couple of years. But that’s not a HUGE deal. I really like the turquoise! It’s bright and cheery. If you decide that you just don’t like the turquoise at all and want to try something else, based on the green/yellow combo of your great room and kitchen you could try a chocolate brown or a shade of red! Awesome job! Good for you for being creative and going for it! I decided today to rip out our carpets this weekend and expose the hardwood underneath!! I’m blogging about it…stop by and feel free to give me some painting advice on a possible colour to paint our living room! 1. Put a glaze over the cabinet (you can buy Ralph Lauren “tea stained”) and wipe it over and then wipe most off. It will deepen it and give it a more aged look. 3. You could take the paint back and have them add some grey to it so it isn’t so light. P.S. Did you know you can use XIM (similar to primer) and then regular paint and also paint your countertops if you decide not to get granite right away. Love your vlog….you are an inspiration to me in so many ways. I love the turquoise, it suits your home. It is just one dot of color in a mostly white kitchen. I noticed the blue knobs at the beginning of your video and thought it all looked very nice. Cute but not too cute, you know what I mean. You should live with it for a week. A change always feels very weird at first. @Lori, I was going to say, it all may feel too light and floaty after a while and I agree with Alison, hospitality Haven that chocolate brown or red might ground the room. one more note – you can also make your own glaze with brown paint and a little jug of faux glaze you can buy at Home Depot or Lowe’s. Just mix then together. The glaze allows you more time to wipe off the paint. I also use stain sometimes and wipe it off. One more thing I forgot to mention! If you have a local tile and stone store I would take a look there for some deals (just like the grocery store!). If you have more than one, check them out! A few years back when we were ready to tile our backsplash we went to the “clearance” room in our local store. The clearance room is usually discontinued items, closeouts or a certain “run” of tiles that they can’t get anymore of those. We got tumbled marble for a fraction of what it would have costs us in the “store”. The entire backsplash with a feature tile and grout cost us about $250 with tax! Another deal we got was our granite slab counters. Most kitchens take two slabs, so our local store had a bunch of slabs (just one) that didn’t match any of the other ones. So becuase we were willing to have different island (our island is corian which we have had since we built the house) and perimeter. It costs us less than HALF of what it would have cost if we picked a counter that had mutiple slabs. And they installed it. Actually now that I think about it, it was maybe just over a 1/4 of the price of the “new” ones. This is I think the second time I have visited your blog, and I wanted to say hello. I like what you have done with your bright and cheerful kitchen~ the knobs and the island. And it is similar to mine. Our kitchen is almost the same green as your living room, and the adjacent room (officially the dining room but functioning as the den/playroom) is almost the same yellow as your kitchen. I have used the bright blue as an accent too. 🙂 So we’ve both got the same color combinations. I’ve even got a star on my wall visible to the kitchen. I’ve never seen anyone else do those colors together. It was hard for me to be brave and use color in this house in such a bold way, but I’m so happy I tried it. It is cheerful and happy. I hope you enjoy your freshened up kitchen too! Looking forward to reading more from you. Take care! Your 10 year old did a wonderful job taping! (I have a ten year old too & if I ever do a redo, I’ll have to have her video me!!!) I love your colors (the blue reminds me of Tiffany’s) & your boldness in trying something new. Keep up the great inspiration. Jen, do you like the white cabinets? Do you find that they need to be cleaned constantly with so many children? We have five children and I’ve been toying with the idea of painting my wooden cabinets white but am concerned that every little thing (fingerprints!!) will show on them. Hi Jen, I really like the blue cabinet it gives the kitchen a fresh and joyful look and adds some pizazz to the room. Like you said if you grow tired of it you can whip out another coloured paint and start again. Jen, my island looks very similar in style and I have been thinking about an update for awhile. I have thought about attaching cupboard doors (without the hardware :)) , or beadboard paneling with trim on top of it….the list goes on… I admire your willingness to dive in and paint your island and hardware for your kids…awesome mom award!! I like the blue! 🙂 It’s fun and eye-catching! Love the blue — island and knobs! Thanks for the idea of spray painting knobs. Will be my job/ project for this week! love the blue island! a little too pastel though, i’m thinking. check out at your local home depot for a line of cabinets called Decora…not sure if they have these in all areas? if not, i can email you a picture (the website doesn’t do the color justice). they have a turquoise that has a brown glaze on it. i can totally see it for the space…it’s a little deeper than what you have but still bright and fun. i would also paint the trim mouldings in the blue…and the front. paint is a wonderful thing! love, love, love the idea of painting the gold knobs. you could do the perimeter in the silver and then something totally fun for the island…or just buy a few funky knobs at a thrift/antique shop- just for the new, cool island. you are such and inspiration! huge fan of your blog! Ok…now i want to paint my ugly gold knobs COPPER because last summer my husband and i put up copper tiles as a “backsplash”. Whatdaythink? I think it’s a fun and unique touch! Such a great idea! And it turned out beautifully! I featured it today! Add some orange paint to the aqua paint and it will tone it down just a touch!! So fun!!! Jen~I love the color you chose! I can’t watch the video because my computer is being dumb, but I think it looks so lovely and fresh. the blue knobs you can leave them all year if you want and you asked if it is too bright no way its perfect and cheerful and it is very cozy you can never have too bright love love it I still dont have a website yet im working on it new to blogging I would love some tips talk to you soon im so happy I found this site. I spotted your video on youtube and love your ideas but I can’t find the link to where you describe HOW you painted the laminate cabinet – the paint you used, how you prepared the cabinet, etc. Sorry for being a clod, but please direct me to that how-to link as soon as you can! I know you said that the folks at Home Depot gave you some good tips but I would like to read your experience first. Thanks so much! Krista – My apologies. I started the post and never finished it. I painted our island nearly two years ago, I think, and it’s still in perfect condition. I don’t regret my decision AT ALL. I lightly sanded it (to de-gloss it), but didn’t spend much time doing that. I just did it very quickly. Then I put a Kilz Primer on, followed by my choice of color. I didn’t put a sealer over it or anything and it’s been great. 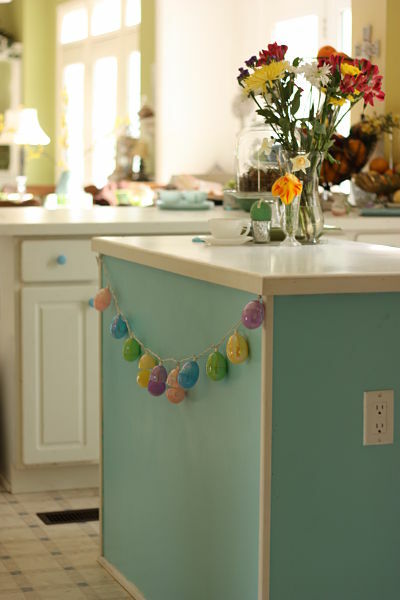 This is a cute and cheery kitchen! Don’t change it for anybody unless you don’t like it yourselves. Why not have a happy home and kitchen? Here’s what I do, if I paint something like a room and am not sure about the color, I try to live with it for a while (a few weeks or months) and then decide if I will keep the color or paint over it. I personally think your kitchen looks cute and happy especially for your kids. If it makes you happy then keep it. Your home makes me want to stay in your kitchen creating beautiful food. I just painted an old 50’s metal cabinet (that’s looked hideous in my kitchen for years) the most gorgeous shade of TEAL. I am loving it already! I have another old metal cart in the breakfast nook that I spray painted a robins egg blue. It is decorated with red place mats and vintage tea towels. Thanks for your directions on painting your laminate cabinets. Been in my home for 5 years, hating the laminate cabinets but as they were only 5 yoa, and not the budget to replace, I’ve lived with them. I thought I could paint them but had never seen any painted ones and were a little nervous about it. Thanks giving me the “nerve” to go for it (if I can talk the hubby into it as well). Love your pop of blue in the kitchen. Good luck finding the granite piece at a discount. I’ve looked for six months to find a “scrap” piece of small granite (2×4 in dimension) for a island the hubby made me but still found it too expensive for my budget. As a result he has made me a top using 2×4 laid side by side, glued, stained and varnished and it looks great!